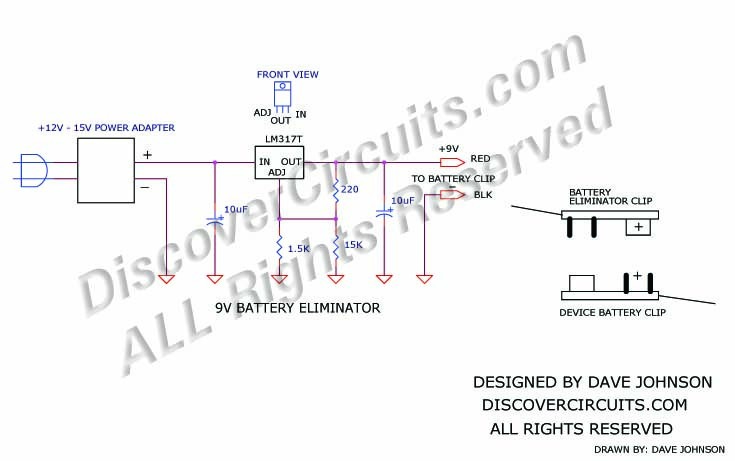 Circuit: 9v Battery Eliminator__ Circuit s designed by David A. Johnson, P.E. If you use 9v battery powered devices for long periods of time, you may get tired of constantly changing batteries. The circuit below can be wired into any 9v battery powered device, drawing power from an external AC to DC power adapter. I designed the circuit around a very common LM317 adjustable voltage regulator. The circuit uses any off-the-shelf +12v to +15v power adapter. These are very common and can be purchased from a variety of sources. I included an illustration showing how to make a 9v battery clip, so the eliminator can just snap onto the electronic device’s battery clip.